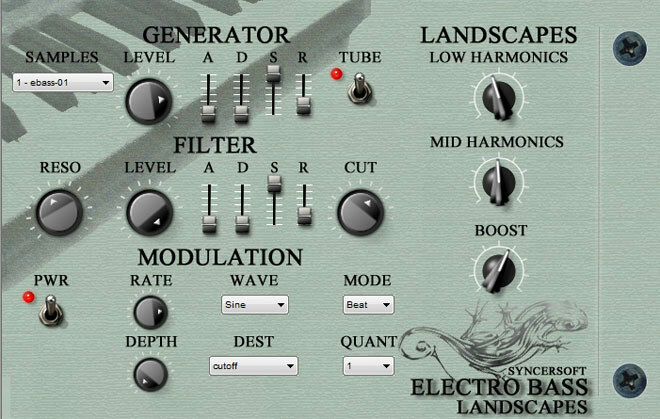 Electro Bass Landscapes is the electro bass ROM synthesizer. It is intended for creating some musical effects in cinema and play scoring, in studio. It’s ideal for use in dance, techno, dubstep, electronica, drum n bass, big beat, dub, reggae and all other styles. Electro Bass Landscapes includes a comprehensive 180MB library of over 50 sounds driven by a friendly internal librarian to find the exact sound you need in the heat of the creative moment. LFO modulation section was designed specialy for Dubstep genre but can be used in other styles too of course. LFO modulation section for dubstep bass effect specially.